Sunday at church our pastor was talking about one of our members who had a baby shower at the church this past weekend. The woman stood up and talked about how blessed she was and all the nice things they received. I smiled and thought back to my baby shower from the church and remembered the outpouring of wonderful gifts and cards we received. Our church truly has good people in it. As I was looking around the sanctuary at all the families I realized something, though. I am the only stay at home mom in our church. 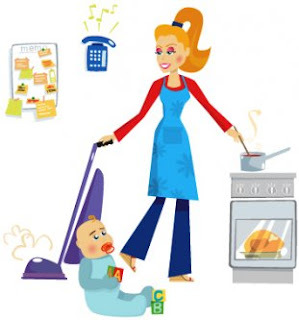 Every other Mom that goes there has a full-time job away from the home. Don't get me wrong, I love our church and everyone there has always been kind. But it makes more sense that I've sometimes felt like I'm having to defend my choice to stay at home with the kids. And maybe "defend" isn't the right word...I'm not sure what is. But I do know that I have been asked MANY times, "What are you doing? Just staying at home with the kids?" JUST? I don't mean to get into semantics...but that "just" is the thing that bothers me. Family Member (FM): So you got married a couple years ago, I remember that! Me: Yes, and we have two kids now. FM: Yeah. So did you ever finish school? Me: Well I went to Such & Such University* for awhile and then after Zeke was born I went to Blah Blah College online for awhile but got busy and didn't finish - maybe someday. I do some writing now though! FM: Oh. Well do you work? Me: No, I'm a stay at home mom. We just started homeschooling this past year! FM: OH. *awkward silence* Well that's...interesting. Yeah. The rest of the conversation was pretty much like that! I feel WE feel that for our family this is what's best and I always try to let people know that. I'm not anti-working moms or anything like that. I think that whatever works for you and your family is great - as long as you're all happy and functioning well, then that's what matters. I guess it just irks me that other people don't feel that way or that I feel like I have to defend myself. I've found a TON of women online (and a few in real life) that feel the same or similar to what I do about staying home. I also have friends who have work at home jobs, friends who volunteer and friends that work part-time and/or full time jobs. Girl, I feel your pain. I am battered with the whole "sahm speech" as well. Just because I stay at home doesn't mean I am lazy, just like you go to work doesn't mean you hate spending time with your kids, and you love money more. Hey there! Just wanted you to know that I LOVE your blog! I am awarding you with the STYLISH BLOGGER AWARD! Hope you'll head over to 3creativechics.com to check it out! I totally TOTALLY feel you on this one. I too am a stay at home mom and a writer and somehow I always feel like I'm apologizing by saying "I'm at home with my kids." And that "just" is the worst. But it's the most important job. And most of the days I'm exhausted, but I do love my kiddos!